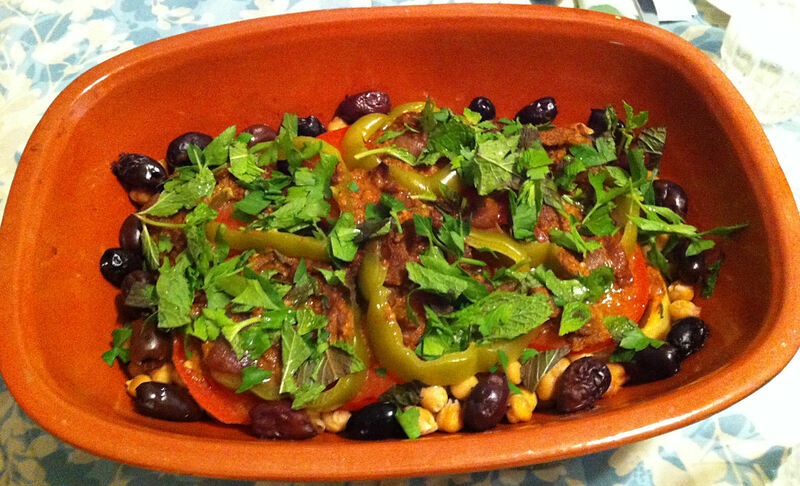 I wanted a vegetable dish to go with my Moroccan lamb this Sunday. I just put Miriam on a plane for Milan, Italy, on Friday and I pick up her husband, Chris, who is just getting back from NY on Saturday. Chris is on the Adkin’s diet, so this dish must fit his needs—out go the starchy vegetables, fruit and flour as a thickener. I made challah this weekend and it was so successful that I had to make it again. The question was: What do I serve with it? 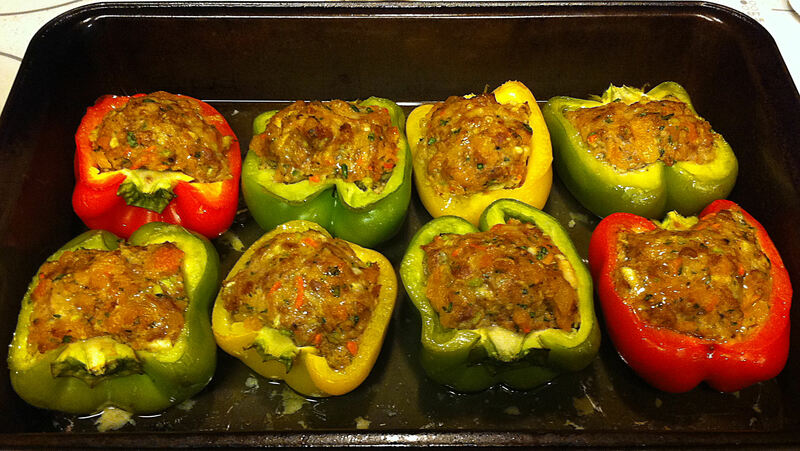 After several rounds of bargaining, Jan and I settled on lamb stuffed bell peppers. Two Sundays ago, I bought some Persian cucumbers for a dinner that did not happen. I did not want them to spoil. 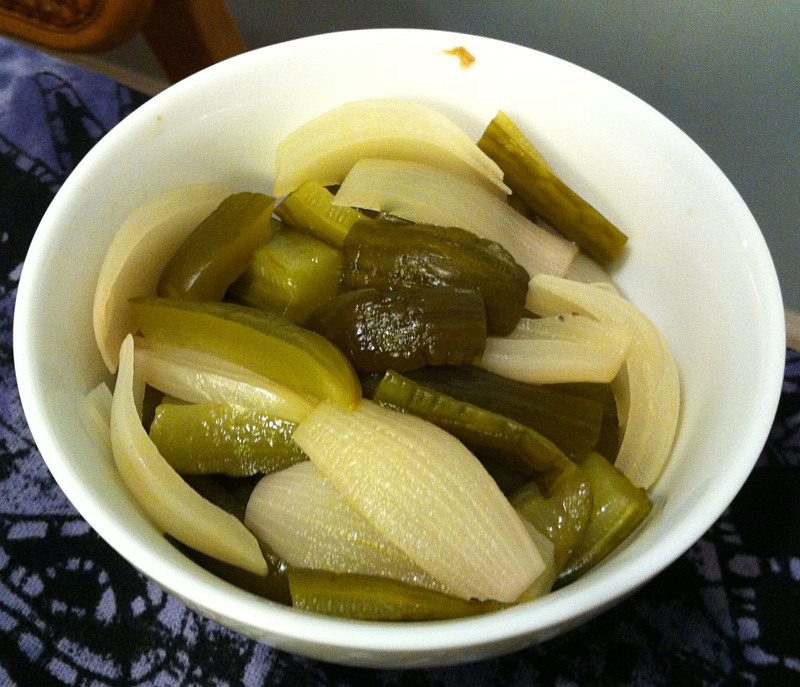 There were too many of them just to eat on my own, so I decided to make pickles with them. I usually do my traditional recipes for Thanksgiving. I do not do anything spectacular for the turkey (butter and Bell’s Poultry Seasoning under the skin and apple, lemon and herbs in the cavity) and I have already posted my Thanksgiving stuffing. Chris, my son-in-law, requested my cauliflower au gratin (yes, this is the third time in three weeks—he and Jan really like this dish). Other dishes we made this year were Jan’s Cranberry Cumberland Sauce and Jan’s Pecan Pumpkin Pie (this was just her pumpkin pie topped with pecans). 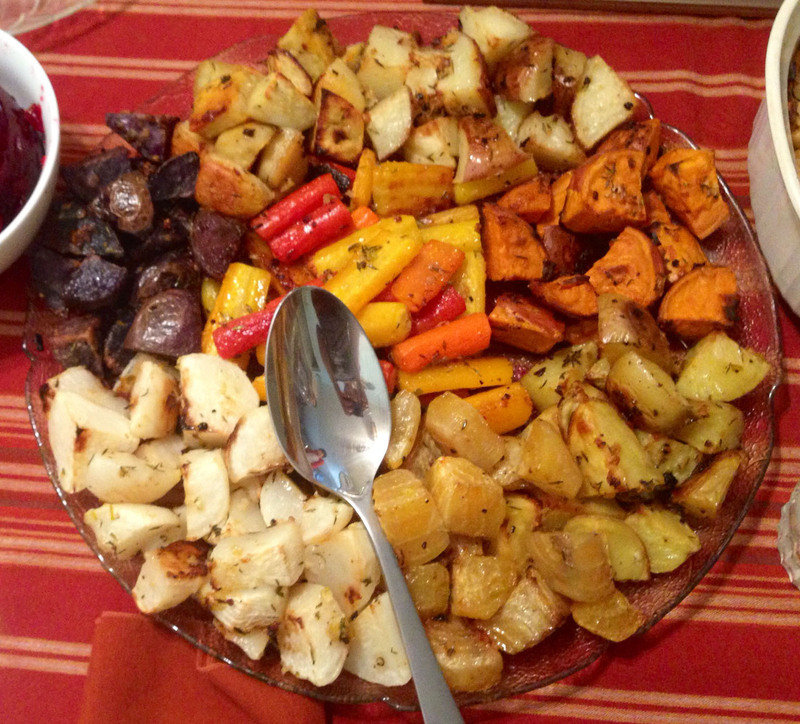 The other dish that Jan requested for this year was mixed roasties. Jan is still struggling with her cold, so she wants soup for the second day in a row. 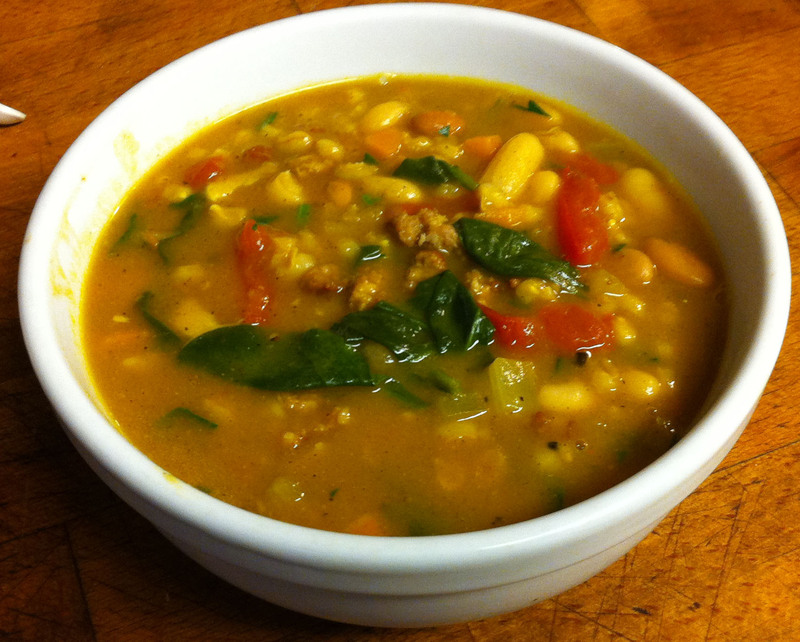 I did not want to make the same thing I did yesterday, so I was trolling through the WordPress reader for soups. I looked at several, before one finally caught my eye. Since wife Jan is limiting her carb intake I knew that she would want something in addition to a pasta dish. I had bought a tomato, thinking I would add it to my pesto dish, but I changed my mind. 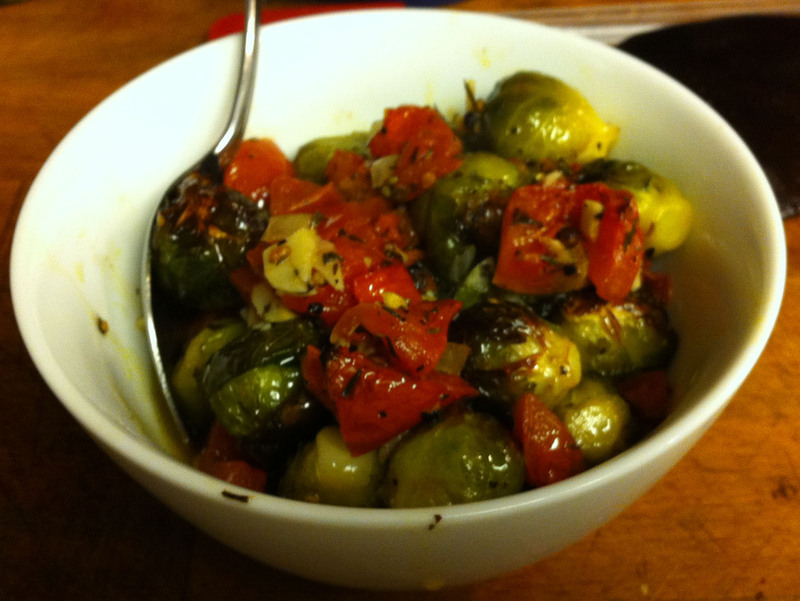 I had bought some small Brussels sprouts, one of Jan’s favorite vegetables, at the farmer’s market on Saturday. However, I had only bought a half a pound, not quite enough for a full side dish. Putting these two things together and roasting them seemed like a good idea. I wanted a new side dish to go with my Pork Tamales with Mole Poblano. In Mexican cuisine beans and rice are the standard side dishes. 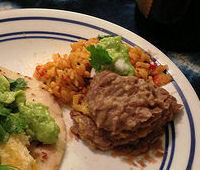 Refried beans do not really lend themselves to a lot of variation. This left me to do something with the rice, but I wanted to do something other than my usual Mexican Rice. 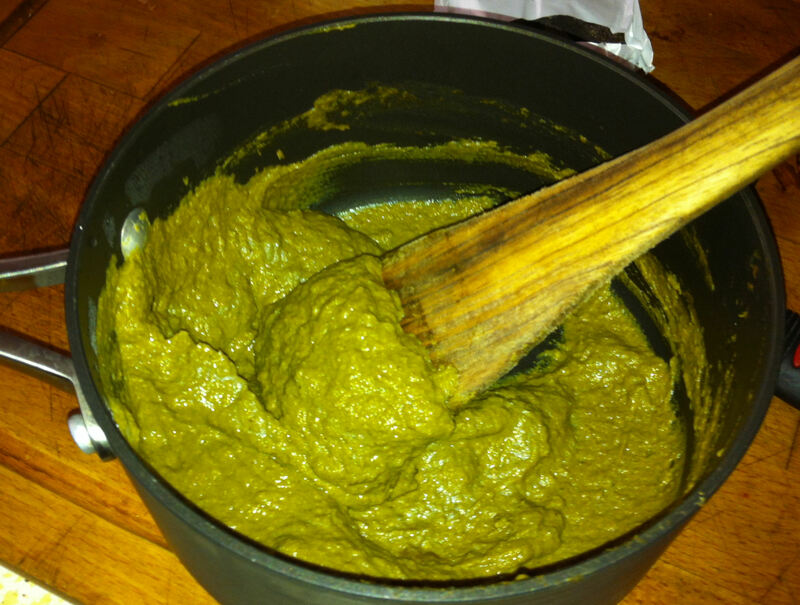 I thought about making a green mole rice, but when I Googled “Mole Verde” most of the recipes were on how to use this sauce on chicken with rice as a side dish. I have been trying to make Mexican rice for years with only limited success. Yes, the rice I made usually tasted good, but it was always a bit gummy. 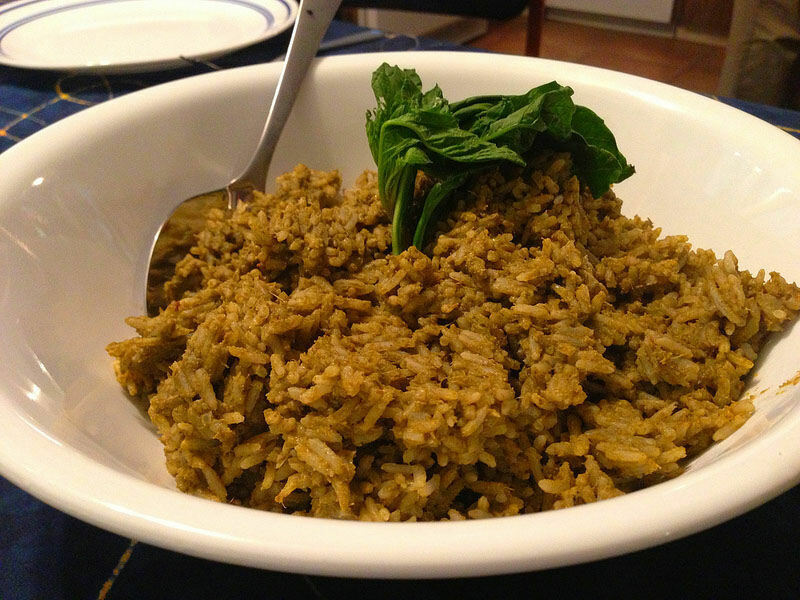 It never turn out like the fluffy savory rice you find in almost any Mexican restaurant. This is one of those ethnic “home cooked” dishes that, if you did not watch your mother making it growing up, you will rarely discover the secret to making it. This technique is really not a secret, it is just considered too obvious to mention by the people who grew up with the dish.